Tops Salon has expanded the boundaries of the traditional salon to encompass indoor services and outdoor events. To their hair styling clients they are a welcome source of artistic expression dedicated to enhancing their personal sense of well being. To many others, Tops Salon is an outdoor entertainment venue that hosts special events and beauty symposiums. To all of their guests, Tops Salon is a unique experience unlike any other. 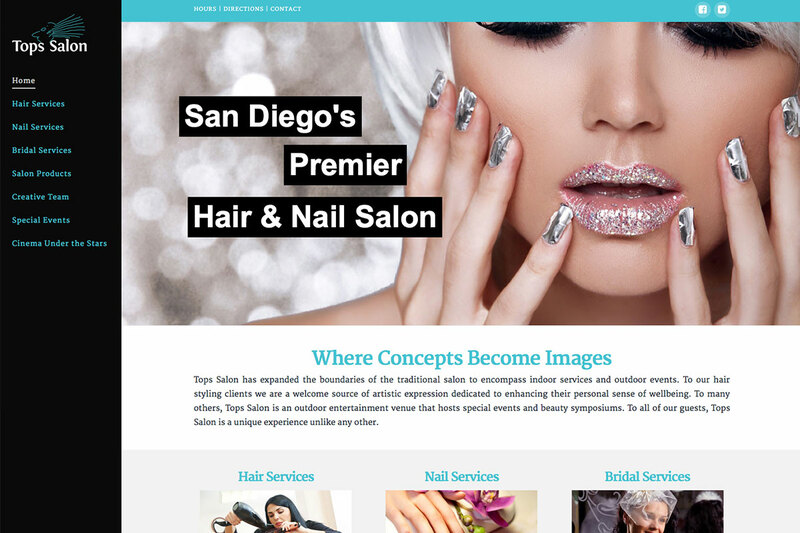 Like many business websites around today, the Tops Salon site was built in the old style of table-designed pages. In the modern age of required mobile-friendly websites (thanks Google), a company should never rely on a table-designed website. Even with a tight budget, I was able to achieve a modern design for Tops Salon. Clean, effective, with a focus on a better customer experience and the ability to scale up as needed, I built their site from the ground up – using WordPress, of course.